IDF official says he doesn't see the end of this round of fighting, Israel is recruiting reserves and moving forces to the south. A senior IDF official spoke on Thursday morning with army journalists about the recent escalation in the Gaza border area, and said Israel is close to fighting a difficult war with Hamas. "I don't see the end of this round," the official said. "We attacked over 140 targets, and we're preparing to continue the attacks." "The IDF will move additional forces to the south. The IDF is recruiting reserve soldiers to the Iron Dome batteries. It could be that this will continue for some time, in order to return quiet to the south. "If we need to, we'll evacuate Jewish towns up to 4 kilometers (2.5 miles) away from Gaza." Since midnight, Gazan terrorists have fired over 80 rockets at Israel, bringing the total number of rockets fired since Wednesday afternoon to over 150. At approximately 5:30a.m. 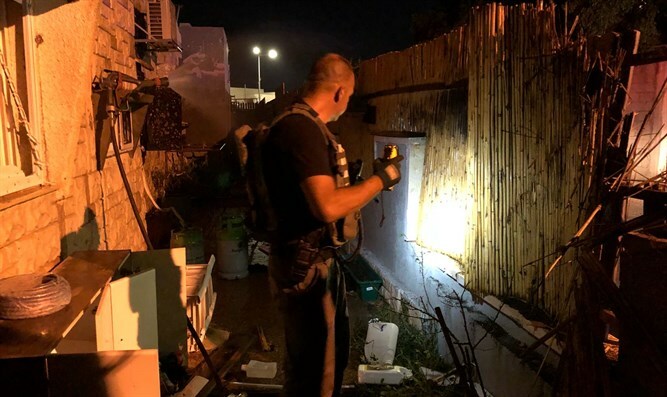 a rocket exploded near a building in the Eshkol Regional Council. As a result of the rocket attacks, a woman of approximately 30 was seriously wounded and a second person was lightly wounded. Regarding the elimination Tuesday of two Hamas terrorists who fired at IDF soldiers, the official said, "It's not certain that that was a mistake. We didn't know they were showing off weapons, and it's not something which should be done on the border."